A while ago, I posted about Steiner in Maastricht. 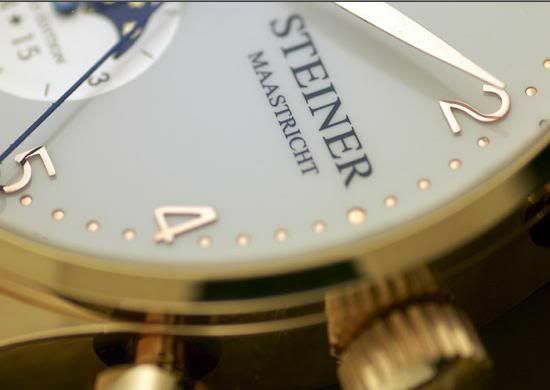 A few days ago, I received a newsletter from Steiner about their own watch to honor the founder of their shop, Mr. Steiner, who passed away a while ago. There are 24 watches available since the 24th of November, to honor the store which is 24 years old. The watch is available in rose gold and platinum. The case has a diameter of 42mm and is 12.5mm thick. The movement is based on valjoux caliber 7751 (which features a moonphase complication). More specifications and the prices can be found on the Steiner Limited Website. All watches are numbered and include a handwritten certificate and a leather traveller’s case. Click here to visit the Steiner Limited website.